With a classic style that is versatile enough to fit any space, our Hardwood Jewelry Chest serves as a safe place to keep your jewelry organized and ready to wear, or offered as a gift that will last a lifetime and provide the perfect sentiment anytime it's used. 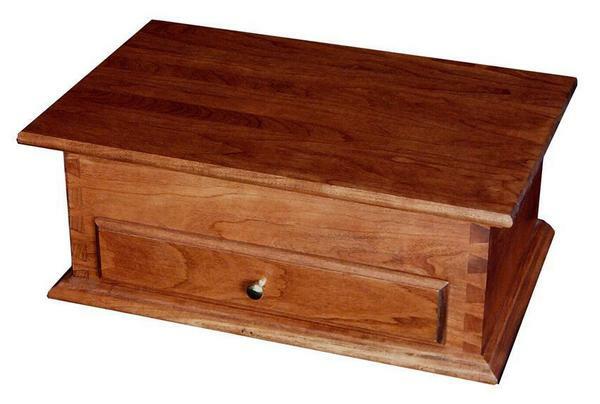 Crafted from your choice of Oak or Cherry Wood, this stunning jewelry box features dovetailed joinery on all four corners that provide a unique look to the finished piece. The flat, hinged lid opens to reveal felt lined storage inside, along with a pull-out drawer below, providing plenty of options when it comes to storing and organizing your jewelry. On the bottom, a molding trim is placed all around, providing a stable base for this jewelry chest atop your dresser, nightstand, or anywhere else in the home. Available in Oak with a Medium Walnut Stain, or Cherry with a classic Washington Stain, you can choose the perfect combination to complement your decor. If you had a different combination in mind, please give us a call to discuss your preferences. Our furniture specialists are available to answer any questions, provide a free custom quote, stain samples, and to help you place your order by phone.